A thriller about a child serial killer in Communist Russia during the 1950's starring Gary Oldman, Tom Hardy, Jason Clarke, Noomi Rapace, Joel Kinnaman and Vincent Cassel should have me jumping for joy, right? Well, I certainly thought so. I thought for sure this was going to rock my world. I didn't know going into this film that it was based off of a book. Even now, as I read about it, I have no idea who Tom Rob Smith is, and I had no idea this was the first book in a trilogy. All I knew is that I was sold on the trailers and sold on the actors, and I was hoping for a great, great movie. Let me start with what works. The cinematography is gritty, edgy, smuggy, and creates a perfect landscape for Communist Russia and the set-up for a thriller. I think Hardy, Oldman, Rapace, Kinnaman, Cassel and Clarke do exactly what they were told to do. I think these six actors could do a rendition of "Whose On First" and make exceptionally entertaining. Even Charles Dance appears for a little while and delivers. The sets and costumes really spell out this era, and everything looks authentic to the time period. But this is all the extra stuff, this is all amounts to fluff. What kind of story does the movie tell? Apparently, this is a thriller, does it have the ability to thrill? Will this movie have the conviction and execution to shock my foundation as a person? A great thriller is something that has me chewing on it for weeks end, could "Child 44" do that for me? Look, even though this film is packed with great actors, I wish the movie provided a better accent coach. There were several moments in "Child 44" where each actor's Russian accent slips here and there, and it gets to the point where it becomes distracting. There have been several American, British and Australian actors who have tried various accents, and with varying results. There are so many people out there who think I am weird for liking foreign films. But sometimes I like a good story from an authentic production, and actually watching members of a country playing their nation's countrymen has a feeling no Academy Award winning actor can duplicate. But in "Child 44," it was almost unforgivable how raggedy the accent handling was. The biggest sin "Child 44" commits is it has a story that is all over the map. I was ready for a gritty tale of a man trying to find a serial killer in a nation that doesn't believe in murder. This is a world that believes that murder is capitalist institution and that living in Communism makes people perfect. 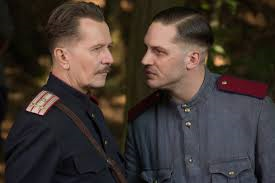 Its a great idea for a movie, but "Child 44," takes more time making a movie about living under Communist rule over anything else, and its handled as such a wet blanket that its not even interesting. There is so much focus on the horrors of Communist living that there is barely any time taken to solve the mystery of the movie. When the killer is revealed, its so on-the-nose that its not even thrilling. Look, I think a movie about living under Stalin could make a gut-wrenching movie, but sucked the main story dry. The worst thing a thriller could do is a) not be thrilling and b) not be shocking when the killer is revealed. I felt "Child 44" fumbled in both those arenas. At almost two-and-a-half hours long, it feels more like an endurance test than a thrilling caper. "Child 44" is so poorly paced that I almost wanted to laugh. The handling of the serial killer and his big reveal is just a wash. Plain and simple and I am not sure if the movie cut back on the Communist crap if the reveal would have been any more surprising. Not a good sign in my book. I appreciate good performances and cool sets in any movie, but that is all window dressing to me. If you say your a thriller, I feel I should walk out of the theater thrilled. If you say your movie is going to do one thing, I believe a movie should do that thing, not make its subplots the only plot. "Child 44" is nothing but a reminder of why we need movies like "The Silence of the Lambs" in existence.